We can't wait to talk all about the latest episode of Berserk, bringing us on the doorstep of a long awaited moment in the series, one that could transform it forever. We also provide a preview for the upcoming Berserk Official Guidebook, review the new Berserk-themed Hirasawa Susumu album, and thank our Patreon donors for their continued support. Ahh thank you for this. I've been waiting for it. I love hearing you guys discuss. thank you for another podcast, this one was amazing! regarding the character ages, finally to get a confirmation for Guts and Griffith! and of course Schierke and Sonia. The first review on amazon japan says something about pippin being 19, bootleg google translations were used so it could be completely wrong. Such an exciting moment to be a Berserk fan. Like I said on the podcast, I'd recommend taking these numbers with a pinch of salt. It's unfortunately not at all sure they were fact-checked by Miura, as opposed to being guesstimated by some random guy at YA. That's often how these guides are made. A podcast so nice I listened to it twice! (A day apart ) Great job guys, I think you covered a lot of questions and ponderings that I had had about this very dense latest episode. In a few ways, I feel like this particular installment functions as a continuation to the Casca SkullKast you did a while back. Amazing to think that story elements you were speculating about then are already coming to fruition! I especially like the point that was made about Guts not being part of the rite to restore Casca's sanity (I think it was Aaz?) - it made me think that it was a smart move on Miura's part, because it allows an opportunity to get Schierke and Farnese caught up on what happened to Guts and Casca, but also makes the next episode (at least) very much about Casca's feelings. A veritable double-whammy. 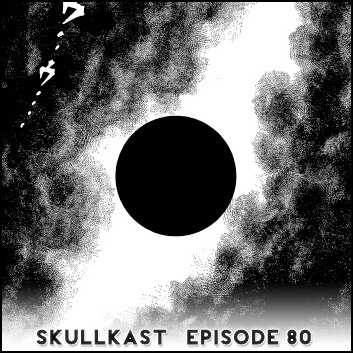 By the way, are you thinking of doing a SkullKast about the contents of the guidebook at any point? Discussion on the sketches for 348 would be cool to hear. I think Guts absence from the ritual will serve dual purpose. I haven't forgotten about those seashells given to the group before they entered the island. I've been anticipating an attack since, with the shells serving as the warning beacon. Thanks! And sorry you couldn't make it. Nah, I considered it, but I think we'll all be better off once we see the full episode properly. We've already gone from dog to horse and back to dog in 2 days And while I'm excited for my guidebook to arrive, other than these sketchy previews, I remain unsure that it has anything substantial to offer in terms of discussion worthy material. Great podcast! Also finally got around to reading the episode. Not much to add to the thread or to what you guys have said except that I wonder if any of the imagery within Casca's dreamscape will have anything to do with very early childhood, possibly stuff we haven't seen before or possibly some things from the brief flashback episodes she had told Guts about in the cave. I wonder if the likeness of the nobleman who Griffith had saved her from, for example, could form as part of a collection of imagery that has been repressed representing all the male figures who have attempted to take advantage of her. Or perhaps as Walter mentioned for the type of imagery used to show her isolation (her being alone in the dark, or out in a battlefield) maybe in keeping with the childhood theme her isolated village in the mountains or her neglectful parents. In any case there's no doubt it's going to be an incredible journey into her psyche. I've also got to thinking about the relationship between Guts and Casca as a whole too, from the very beginning. I kind of want to go back and read that part of the story again, while focusing on the more romantic aspects between the two of them and their budding relationship, the power struggle, the leader aspect Casca could potentially serve, just to get a better idea of how things could be in the future. The dynamic is going to change so much. I could see a scenario where they have to almost fall in love again. Re-discover what makes them so compatible, if at first they clash a bit. It doesn't have to be a big thing, but just something along those lines. I certainly don't think it'll be one of those situations where they see each other across a field and start running into each others arms calling their names. Also just to give my impression about the awesome final page. I didn't get the "eye", especially now that we know there's going to be some type of battle field imagery in the future, it's just an eclipse, shown through black smoke and darkness. There needs to be a light source for the eclipse so the light shining through the dark smoke is necessary, but not necessarily to make the image of an eye. Just a streak of light, which actually reminds me more of the images we have seen of the Falcon of light shining through clouds or smoke in the past. Great podcast, guys! I enjoyed listening. Your insights always enhance my appreciation of the material, so thank you. First time listening to a "Skullcast" and I love the info.